A chance visit to Comet Miniatures paid dividends while I was browsing through their stock of second-hand WW1 models. A little box caught my eye in a classic "What on earth is that?!" moment... a 1/48 scale resin kit of an Aviatik 30.40 - and by a manufacturer I'd never heard of... I must admit I'd never previously heard of the aircraft either so, intrigued, I opened the box... and was instantly sold on it! The Aviatik 30.40 was a prototype parasol-winged fighter powered by a 150 h.p. Le Rhône rotary engine. Weighing just 586 kg fully loaded, it was the lightest fighter ever built in Austro Hungary and apparently demonstrated a very promising performance during trials in the summer of 1918. Production was planned for Thone and Fiala, but plans were brought to a halt with the Armistice later that year. Alliance Models are a new company to me, but must have been around for some time because the decal sheet in the kit is dated 1999. Although I bought the kit second-hand, it's still in production and distributed by Modelimex. Decals for the single prototype aircraft. The casting is excellent and rather reminiscent of Planet Models kits (which is a good recommendation in itself). The fuselage is split into conventional halves, while the wing is delicately cast with a nice thin aerofoil and good representation of the fabric-covered ribs. Smaller details are also good, such as the 11-cylinder engine with separate pots and crankcase, while the distinctive perforated cowl is thin with just a little flash evident. The propeller and some other smaller items are cast in wafers. There are a few casting stubs to clean-up and a little excess resin at the base of the rudder but, encouragingly, I didn't find any bubbles in my kit. Assembly looks pretty straightforward and is broken down into 7 stages. There are a few points at which some scratchbuilding is required, but this shouldn't present any problem to modellers with a little experience. The instructions are a little bit basic, but show the assembly sequence clearly enough and are backed up by a set of 1/48 scale plans and some extra scrap drawings showing additional details. Stage 1 - Assembly begins with the engine. The crankcase and cylinders are finely cast with excellent detail. The exhausts must be scratchbuilt, which is probably the only disappointment in the kit, as it'll be a bit fiddly to produce 11 identical items (I think a little home-casting session is in order...). Stage 2 & 3 - The cockpit is simple, but adequate, with a floor, seat, joystick and rudder-bar, plus a very neatly-detailed instrument panel. There's no seat harness provided, but something suitable should be easy to make from scratch or found on an Eduard WW1 etched set. Stage 4 - Assembles the basic airframe. A point to watch out for is that none of the strut locations are marked on the parts - they must be transferred from the dimensions provided in the instructions. The struts themselves are standard resin - not strengthened or cast around a metal core, so you may wish to use metal replacements for a little extra strength. Stage 5 - Adds the engine and propeller, plus separate "cheek" panels to fair the circular cowling into the fuselage. Stage 6 - Covers the undercarriage - and here's the only obvious compromise in the kit; the wheels are cast solid instead of open-spoked as shown on the boxtop and in the only photo I've found of the original aircraft. Stage 7 - Is all scratchbuilding - with the ancient art of stretched sprue providing the control horns and cables to complete the model. Alliance Models show the aircraft camouflaged in light grey/dark grey wrap-around camouflage and natural linen under the wings and tail. I've no idea if the colours are correct, but the camouflage pattern seems to match the photo I've seen. The painting guide says the struts were varnished wood, but in the photo, it appears they may have been painted in the darker of the topside colours. The cowling and cheek panels are simply described as "aluminium" but they were actually machined with intricate "whorls", which will be fun to try to replicate. In his classic modelling handbook "Scale Model Aircraft In Plastic Card", Harry Woodman describes rolling a tiny cone of fine wet 'n dry abrasive paper to produce miniature "machining" on metal foil. The small sheet of decals containing crosses and fuselage serials looks good quality, despite the possible age of my sample. Produced by Propagteam, the items are thin, glossy and in excellent register. What a cute little kit! It's a classic case of modelling providing a chance to learn about an aircraft you might otherwise never have heard of - and it's just the sort of subject perfect for a resin kit. I bought my second-hand example for £15, which is great value for a kit of this quality. New, it works out at just over £20, which seems a very fair price for such an obscure subject. This obviously isn't a suitable model for total beginners, but anyone with a bit of experience tackling resin kits and scratchbuilding a few simple parts should have no problems. In fact it would probably make an excellent first choice for a short-run WW1 kit thanks to its parasol wing - and anyone looking for a really unusual subject should be well away. Recommended. Highs: An exciting and obscure subject. Very well cast. Good decals. Lows: A few parts to scratchbuild. Verdict: A well produced kit of a very unusual aircraft that should appeal to WW1 modellers with a little experience of short-run kits. 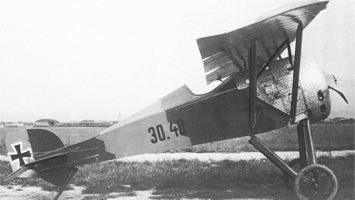 On the original airframe; A parasol monoplane derivative of the Aviatik 30.27, the Aviatik 30.40 was powered by a similar 160hp Steyr Le Rhone 11-cylinder rotary engine. Only one prototype was built and flown during the summer of 1918. The Aviatik 30.40 was of wooden construction. The forward fuselage was covered by light metal panels and the remainder of the fuselage was ply covered. The wing had fabric skinning, and steel-tube bracing struts were employed. The reason we have what we do on Austro-Hungarian aircraft camouflage is because of the late Dr. Martin O'Connor. He did a series in Cross & Cockade Intl. on the various camouflage pattens that were used by the dual-monoarchy air service. I will do a quick look in my volumes later. In the summer months it may have been more probable that green and ochre were use. (Typical Aviatik summer scheme). Going back through the Cross & Cockade issues I have the typical camouflage for summer months in 1918 for Aviatik & Hans-Brandenburg companies seems to have been the "stepped two tone version". The light and dark types Dr. O'Connor discusses point to an ochre & dark green. I have one more source to check. Aviatik also used a streaked type and a mottled series (three colour) I can see I may have to do a thread on Austro - Hung camouflage schemes in the future.